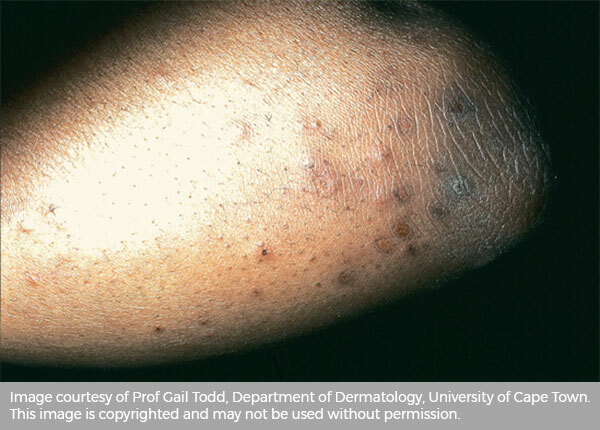 Scrofuloderma results from contiguous involvement of skin overlying another tuberculous process, typically lymphadenitis, osteoarticular disease or epididymitis. Subcutaneous tuberculosis leads to cold abscess formation and secondary breakdown of the local skin, often with sinus formation. 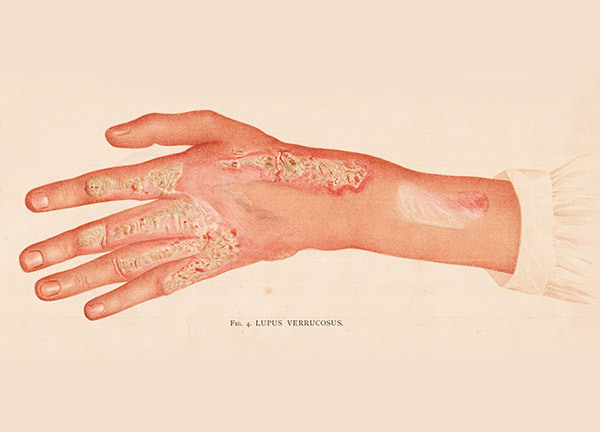 Lupus vulgaris is a chronic and progressive form of cutaneous tuberculosis. It is a post-primary infection, reaching the skin via haematogenous or lymphatic spread, usually from pulmonary tuberculosis. It almost always occurs on the head or neck, typically on the cheek, nose or ear. The initial lesion is a soft reddish papule, becoming a spreading plaque which may be ulcerated, crusted or scaly. There is pronounced atrophic scarring in prolonged cases. Inoculation tuberculosis (Tuberculosis verrucosa) is a localised warty lesion that is usually seen on the hand. It is the result of inoculation of M. tuberculosis, presumably at sites of minor wounds or abrasions, in a person who already has immunity i.e. an exogenous re-infection. In the past, physicians, pathologists, mortuary assistants and medical students were most liable to acquire it. 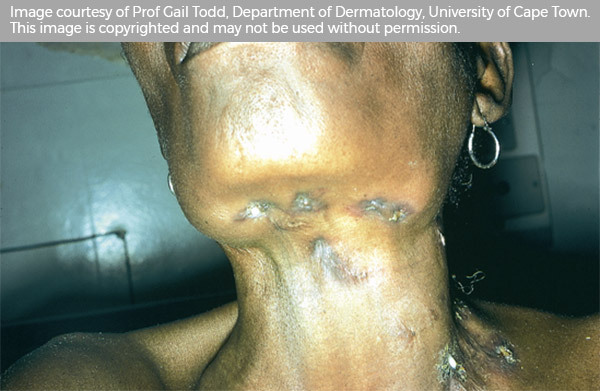 Papulonecrotic tuberculid is a hypersensitivity reaction to tuberculosis in someone who has strong existing immunity, most often as a result of pulmonary tuberculosis. It presents as symmetric crops of papules with central pustules, later necrotic craters, eventually leaving pitted scarring. 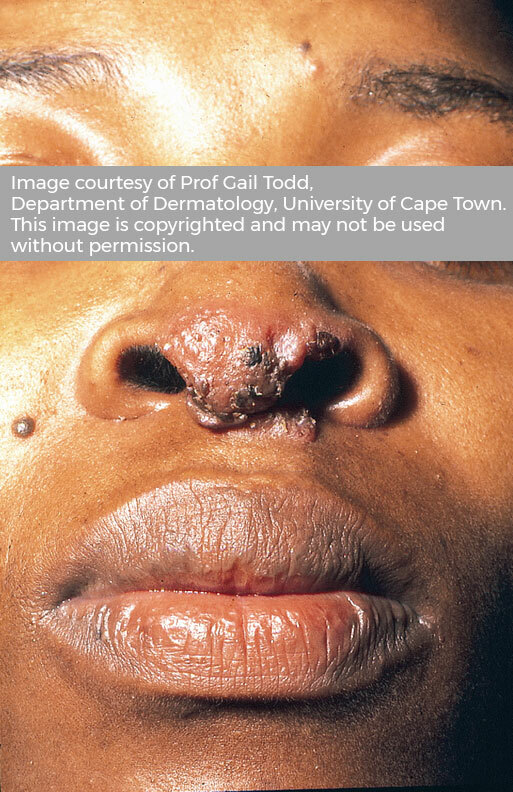 The underlying pathologic process is a granulomatous vasculitis. It characteristically occurs on elbows and knees.